some q's and a's . . .
and i was worried that no one was going to ask me anything. lol! i love that you all came up with such good questions ... so diverse. i have been copying and pasteing these in since yesterday ... and i keep going back and answering them in total random order. so if i missed something ... forgive me ... or yell at me ... either work. lol! and be fore-warned ... this is long! laura asked ... do you think you'll ever make it out to the east coast? to be honest ... i'm not much of a traveler. lol! in fact, my dad has been bugging me for months ... he has some free airlines tickets that he wants to give joe and i to go somewhere for a vacation. but i still havn't really thought about it. i could totally see going out that way for a tradeshow or something ... if the opportunity ever came my way. which my dad would then tell me that "this is an opportunity for you to go somewhere". lol! kaye asked ... love the way you use metal rims, just wondering how you attatch them since they are free floating? i love those MM metal rims ... i think i buy a new pack of them every time i go to the store. and using them in the tag maker is cool. but i just love using them alone ... just the rims. i flatten them in the tag maker. and then i just use about 4 mini glue dots to adhere them ... kind of folding the glue dot a little if it hangs over the edge. glue dots can be smushed to whatever size you need. sometimes they pop up a little ... but i just press them back down. i've thought about using some ki gloo or something ... but i'm not patient enough to sit there and hold it while it dries. wendy asked ... what's your biggest dream? how about your most embarassing moment? favorite indulgence? happiest memory? favorite song? wow, slow down girl! lol! btw ... love wendy ... i don't think i could go through a day without chatting with her! biggest dream ... i'd have to say that honestly, my biggest dream was to design in some way for MM. really, i remember talking to friends about this years and years ago. seriously, a dream come true! most embarrasing moment? i don't think is my most embarrasing moment ... but it was a pretty good one at the time. back when i had lost a ton of hair last year ... i was wearing hats all the time. i remember one day at one of the girls softball games ... it was crazy windy out. we were walking across to the field we were playing on ... carrying chairs and stuff. and i was willing that darn hat to stay on ... like scrunching up my forehead to make the hat tighter on my head. and it flew off ... and i had to chase it for a minute. so my terrible lack of hair that the hat was supposed to be hiding was all out there for everyone around too see. although to be honest ... i don't think anyone even noticed. lol! favorite indulgence? i think that would be my starbucks. i know a couple bucks a day adds up after a while ... and yet, a couple bucks a day just makes my day THAT much better. it's a total bright spot in my day that keeps me happy for a few hours. lol! favorite song? i can't really think of an all-time favorite song. i tend to latch onto songs ... and listen to them over and over for days at a time. right now, as i type this ... i've got billy ray cyrus and miley cyrus playing ... "ready, set, don't go". it's been playing for the entire day. lol! "i'm at the starting line of the rest of my life, as ready as i've ever been. got the hunger and the stars in my eyes, the prize is mine to win". i don't know ... just like that part of the song. cathy asked ... i need a new printer...any suggestions? 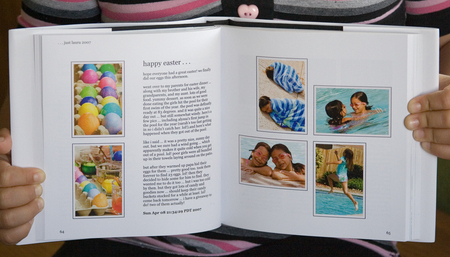 do you print out your own photos or do you have them developed? well, i for one have a hp photosmart d7360 which i've been using for about a year and a half. i only use it for photos ... i use my regular dell printer for regular papers. i don't really know much about printers. but that is a great printer ... and a decent price. love that it has the 6 different color ink cartridges ... that way you only replace the color that is running low. i take my empty ink cartridge to staples ... and they give me $3 back ... so the refills are only $7 a piece. i really can't vouch for any others ... but i know you can really get a good photo printer for a decent price nowdays. as for actual printing of photos? i do half and half. i do upload and order most of my photos from an online site (recently switched back to shutterfly ... wasn't happy with the changes my other site had made). i order copies for my girls and for all the daycare parents. and then limited copies for me. i do like to have some prints on hand for those times i don't want to think too much ... and just want to grab a photo or two and scrap them. but in all honestly ... i love to print what i need for scrapping myself. then i can print whatever size i want, add my borders, make my collages. i like having that control when i have the time. carla asked ... will you please share your secret for putting lines around your photos? i am so sorry to tell you ... but it really IS a secret. lol! would love to share with you all if i could. and i'm sure the info on it is out there somewhere ... and there are probably many ways to do it. but it was taught to me by someone i truely admire and respect ... so i really don't share it in all honesty. since i couldn't answer this one .. i told carla to ask me another question. lol! so then carla asked ... tell us more about you and your personality: goofy, serious, etc? and if you could sing one song to belt out on american idol, what would it be. can you sing? my personality? seriously goofy to be honest. i am a gemini ... so i think there can definately be two sides to me. i have my moments where i'm super quiet and moody. but most of the time ... i'm really funny and sarcastic. sometimes in a dorky way ... i admit that i can be very dorky. but i can honestly say that these kids here get quite a show from me on a daily basis ... i do not let them down when it comes to entertainment. and when they're old enough to talk ... i hope they tell their mommies and daddies that. lol! like when i saw one of my previous daycare girls last week at softball and she said that she had seen my driving the night before ... and i said "what was i doing ... picking my nose or something?". and her laugh said it all ... they know how funny i am! and i am very sarcastic ... sometimes i have to tell people that i'm just kidding around ... because they might take what i'm saying too seriously. and really ... i take nothing too seriously ... very easy going. one song on american idol ... i think before he cheats by carrie underwood would be so much fun to perform. one of those songs you could just totally belt out with attitude. that being said ... i CANNOT sing. lol! actually, i take that back. i CAN sing any kids song. any disney channel or nickolodeon channel theme song ... and any song from "high school musical" ... and they sound really good. but normal, grown up songs ... yeah, not so good. lol! heather asked ... if you could live in any other state where would it be? i'm a born and raised california girl. but i've always loved the idea of living on a farm somewhere ... with spread out property and land ... with horses and maybe a pond. and yet ... i think that would drive me crazy at the same time. lol! not being able to drive 5 minutes and find target, starbucks, and any other place imaginable ... that would be hard for me. as for a state ... no idea why, but colorado has always sounded good. although honestly ... i know nothing about the state. lol! is that a place you would find a farm? but it has snow, right ... i'd never survive in the snow. lol! 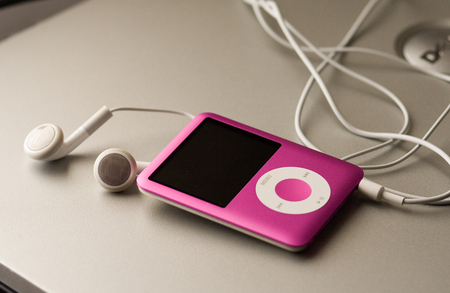 leslie asked ... whats the very first song on your ipod? how do you know when to call your scrap space a studio? is it when you've become published? when it's custom done? whenever you feel like it fits? what famous/known scrapper would you like to meet? first song on my ipod ... right now, it's aly and aj ... specifically "rush", "on the ride", and "speak for myself". i can just play those over and over. i'm actually a country music fan at heart ... but i do love those girls music! and when can you all your scrap space a "studio"? good question. i had a great space when i was downstairs in the bedroom ... an entirely different look than i have now. the room was a light, bright green color (did that even make sense?) ... and the furniture was all white ... and all my storage was clear and plastic. nothing wrong with that ... it was really nice. but i love my space now ... and it just feels like a "studio" to me. the darker colors ... the baskets and jars and metal bins. just feels artsy to me. i think it's really about having your space. and having it be a space that you want to go hang out in ... and that inspires you to create and play and have fun. whether it's an entire room, a loft (where i'm at), a closet, or the dining room table ... any of those places has the potential to be your "studio" if it makes you want to create! as for who i would love to meet ... i'm going with cathy zielske. i think she comes off like such a fun person. love her sense of humor. have you seen her blog videos this week ... always funny ... you have to watch them. in fact, i love the idea of making a video ... and i'd like to think i'd be as funny as her. plus, i love her style. totally not my style ... but i still love it. lisa asked ... when you're at starbucks do you get venti, grande or tall? ;) seriously, when was the first time you were published? where? what was the layout? always a venti java chip frappacino. i figure if you're spending that much for the drink, what's 50 more cents to get the huge one. lol! plus, when you get the grande ... there's just something different with the ratio of drink to whip ... just isn't the same. lol! the first time i was published? actually, i got my first 2 right at the same time. 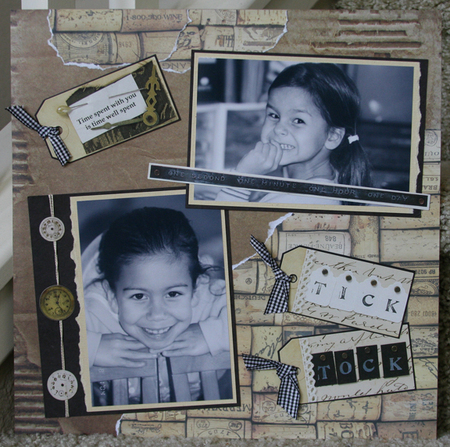 i had "tick, tock" published in the april 2004 issue of ivy cottage magazine (which eventually became scrapbook trends). and i had "live, laugh" published in the june 2004 issue of paperkuts magazine. which they were actually 2 months apart issue-wise ... but it happened at the same time. and i'll even show them to you. because honestly, by now i think you deserve a break from reading and need something to look at. lol! sara asked ... how many design teams are you on? which magazines do you submit your work to? do you ever go to crops or have a friend to scrap with? how often do you purge your stash? how many times a week do you cook? what's your favorite adhesive? give the girl some time to think and she comes up with a slew of questions. lol! just kidding sara! i'm on making memories design team right now ... which is definatley enough to keep me busy. lol! and i've actually only been on 2 other teams ... one of which was just a tiny online site ... and the other was a manufacturer (lil davis). 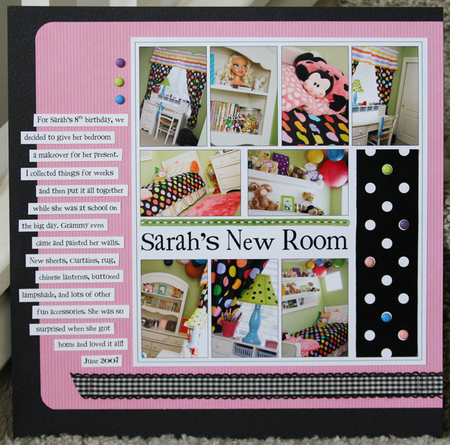 i mostly submit to scrapbook trends and scrapbooks etc. i do send some stuff over to creating keepsakes every now and then ... i've just never had any luck there. and for every one that i do get published ... there are about 20 that didn't get picked. lol! i never go to crops. well, i did go to a little crop night at my friend deneen's house once ... but i ran out of things to do in about two hours. i just have never been able to pack everything up and go. i think it's because i DO have my own space ... so it's all out there and organized. i wouldn't even know how to pack up. i think it would be fun for the social aspect ... because i really am a talker. lol! but i'm also the kind of person that would feel like i was wasting time if i wasn't getting stuff done while i'm there! i am big on purging my stash. i would say on average i do it every 2-3 months. usually just a quick go-through ... grabbing things that i'm still not using after holding onto it for so long. and on occasion ... i really get in there and go through stuff ... like going through all my pattern paper, etc. as for cooking ... i've slacked off some lately. softball season has taken it's toll on the cooking ... with 3-4 weekday evenings a week, i'm just too tired to come home at 7:30 and cook. but we're done with softball next week ... whoohoo! then i'll get back to normal ... cooking about 4-5 nights a week. the other nights are fend-for-yourself nights. lol! for my favorite adhesives? i use herma tabs for most things. not always as strong as i'd like ... but they work. i love my duck adhesive for journaling strips ... just the right width ... and i find it at wal-mart in the 4 packs which are a great deal. and my glue dots ... i have them in all sizes. mini glue dots, regular glue dots, glue lines, 3-d glue dots ... love those things! sierra asked ... how do you make the photo collages? i kid you not ... took me forever to learn. but once someone explained it too me ... super easy. 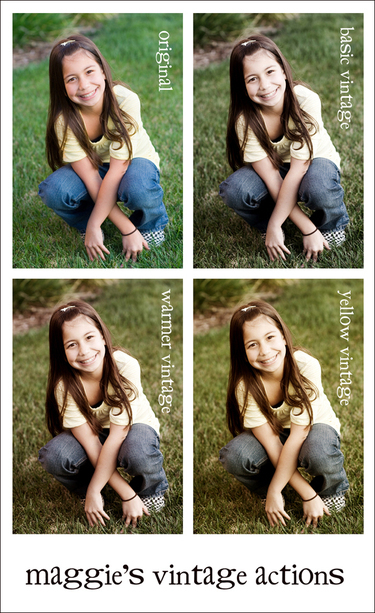 i do these in photoshop ... i use both elements 4 and cs2 ... both seem to work fine for the collages. i just select a "new canvas" sized to what i want (8x8, etc). then i open up each photo and resize each one to the size i want it within the canvas (2x3, 4x6, etc). then you copy and paste each photo into the canvas ... and you can move them around to get them positioned right. hard to sum it up here. but if anyone does want the basics for making a photo collage ... i do have the info typed up and saved. so i can very easily pass it along. just be warned ... i have this way of explaing things that makes it seem harder than it really is. lol! but feel free to email me if you want them! 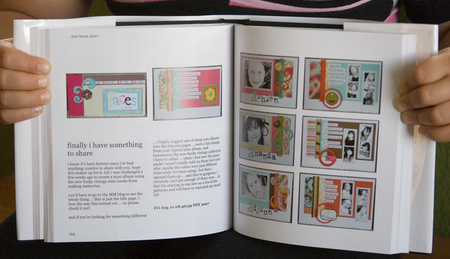 nikki asked ... who inspires you in the scrapbooking buisness and why? who inspires you in the photography business and why? 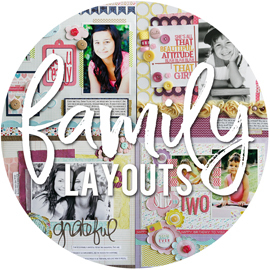 how many times a week do you get to scrapbook? are you a morning, mid day , evening or late night early morning (you know the 10pm-2am scrapper lol, this is me sometimes)scrapper? what was the last movie you watched? a few of my absolute favorite scrappers that have always inspired me? erin clarkson (aka erin terrell) is my number one favorite ... have loved her work since the very beginning. also love robyn werlich, maggie holmes, keisha campbell, jennifer mcquire ... they've all been long time favorites of mine. favorite photography? maggie holmes, leslie lightfoot, karen russell, audrey woulard, tara whitney ... just to name a few that come to mind right away. 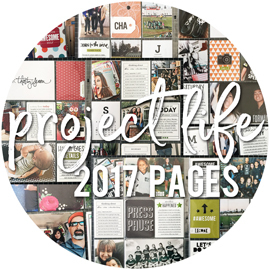 for how often i scrapbook ... i would say i do something just about every day. not serious, "get-in-there-and-create-a-ton" type scrapbooking ... but something. i try and do little bits throughout the day when i get a moment here and there ... i even bring stuff down and spread it out on the kitchen island. but i never accomplish much. too many kids needing too many things ... tugging on my legs and demanding i hold them and entertain them. i guess that's ok ... it IS my job after all. lol! the early evenings ... that's when i tend to scrap the most. after the daycare kids are gone ... and while i'm hanging out upstairs with the girls. i do not scrap after they go to bed ... used too ... but not anymore. i'm a total nightowl ... but not for scrappin. always too tired to think too much. and the weekends are big for me ... i get into my groove since there aren't so many "little" interruptions (translated to "little daycare kids") to distract me. last movie i watched? "juno" ... watched it last week i think. good movie. i have "27 dresses" downstairs ... probably watch it tomorrow night. cathy asked ... how long did it take you to get published from the first time you submitted something? i think back when i had my first layouts picked up ... that was before i used to email them over. i think ... although i can't be totally sure ... that i had taken pictures and actually mailed them in. yeah, in an envelope ... with a stamp. i would venture to say i'd been submitting for about a year before i had anything picked up. then i went almost an entire year before getting any more. lol! deneen asked ... if you could have three wishes granted what would they be and why? i wish i was rich. isn't that what everyone wishes for? lol! actually, i wish that because i would love to not have to worry about working. hard to fit everything in sometimes ... in addition to working and toting kids around town. i would totally wish for no more pain. i keep seeing that commercial for lyrica. "are you in constant pain every day?". and i'm like "yes, i am". "do simple, everyday tasks become hard for you to do?". and i'm like "yes, they do". so maybe not in those exact words. lol! but after almost 2 years ... to go a few days without constant pain would be nice. dreamy, in fact! and my third wish? i wish that you would all stop asking me so many snoopy questions!!! totally kidding of course! i just couldn't resist that one! lol! and if you could only hear the way i said that in my mind ... you'd see my humor! thanks to all of you for asking all the great questions. loved thinking up answers for these ... and a great way to randomly blog about all sorts of things. lol! i do have a new layout to share tomorrow ... from our marine world trip last summer ... with all the fun journaling straight off my blog. signing off now ... that was a TON of typing ... which i'm actually not so great at! lol! just an update ... still taking questions if you have any others. i have most of them answered ... but will post them all wednesday night. still thinking on a few! lol! since i had an entire sheet of white cardstock with the messed up (otherwise known in my world as "not perfect"!) bubble-wrap smushed paint on it ... figured i'd cut it up and make some cards! 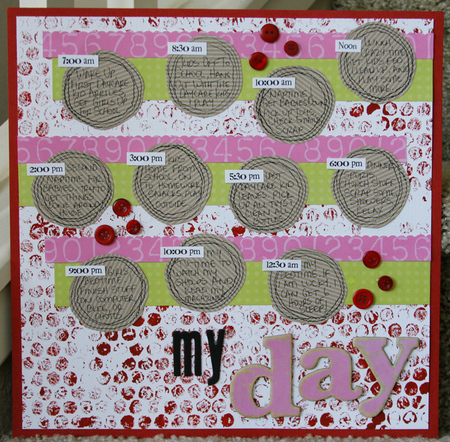 and love the yellow on there ... wishing i had done the stamped circles on my challenge layout in yellow instead of the kraft. but it's all good, right? lol! and those pink circles ... those are from the cuttlebug that nichol and jennifer have unknowingly convinced me i HAVE to have. lol! luckily, my scrappin friend marissa (who needs to blog so that i can link her) has one ... and offered to trade me for a while in exchange for my cricut. kind of nice to be able to trade big tools like that and try them out. i really want to emboss with it ... so we have some embossing folders on their way to us. i think i've been "off" a little on my blogging. i mean ... how long has it been since i've done a "random post"?!?!? and yet, i don't know where i left off ... or what i've shared and what i havn't. i don't know what i want to blog about. plus, i have a lot going on right now ... so part of it is that i'm being lazy about blogging. so instead of me typing up some random post about stuff you may or may not want to hear about ... i'm asking you. leave me a question ... anything ... and then i'll do a question and answer thing in a day or two. sound good? a creative challenge . . .
last weekend heather ruwe emailed me ... asking if i wanted to do a creative challenge just for fun. she had seen the fun challenge that robyn and nichol did the previous week ... and loved the idea. i was totally up for it. sometimes it's just nice to play. and when you narrow down your choices to just what the challenge calls for ... things are easier somehow. so we decided on a few quidelines. first off, we were going to do a layout about ourselves ... something about our daily routine. next up, color choices ... the main colors we decided on were red, pink, and green. also decided to both use the stitched circle stamp from hero arts (thanks sara for the link!). and lastly ... we were both to use bubble wrap! fun, right! i love heather's layout ... and the fun take on what she "needs" on a daily basis. 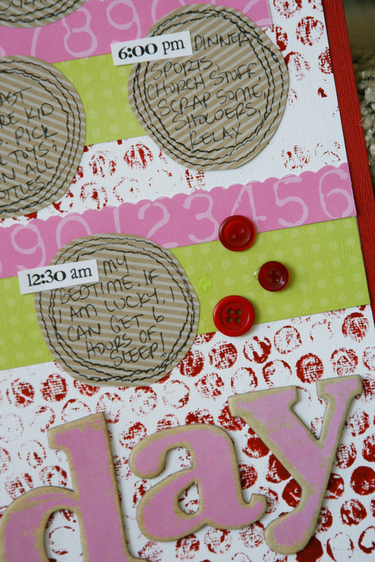 love how she used the heidi swapp daily stickers to frame her journaling. love the way she used the bubble wrap painted strip down the side and accented it with buttons and brads. and love that she used the stitched circle stamp to hold her title letters. i did my layout on my daily routine ... on a typical day. there are exceptions of course ... but this is pretty typical. for the record, the striped kraft paper doesn't look quite so crazy in real life. i think the way it photographed made it look a little more bold than it really is ... it's really more subtle stripes. i cut a huge chunk of bubble wrap and brushed red paint all over it ... and then smushed it down on my white cardstock. 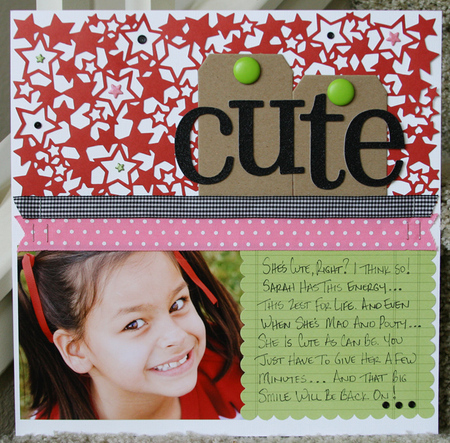 i've actually done this a few years ago for a card class i taught ... really an easy way to add some texture to your page. although don't let you kids pop all the bubbles before you do it ... i had to re-do this because there were too many popped bubbles. lol! 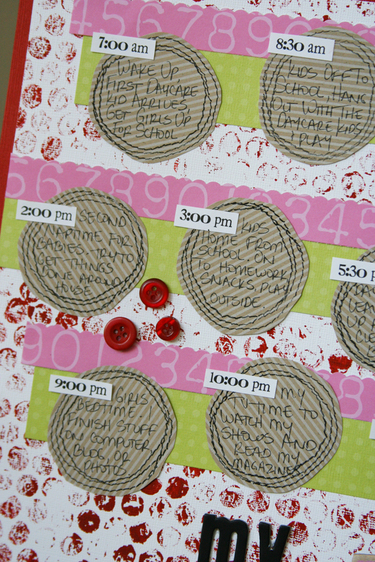 i stamped the stitched circle stamp on the striped kraft pattern paper and then cut them out. then i just typed up my times of the day that i wanted and adhered them to each circle ... and then handwrote what i'm doing at that time of the day. and yes, i should really make a little more time for sleep. lol! i very rarely go to bed before 12:30am ... and i have to be dragged out of bed at 7:00am when the daycare kids start coming. this was such a fun challenge. and i thought it was kind of neat when i saw heather's layout tonight. we did pick out the colors ahead of time ... but there really are a lot of shades and varieties of any given color. so i thought it was funny that we have the same shades of green, pink, and red. and we both went for the KI memories "color theory" green pattern paper. and we both used kraft cardstock. and we both used red paint on the bubble wrap ... on white cardstock. little things ... and yet so cool that our minds were working in such similar ways without even knowing it! lol! thanks so much heather for asking me to play along!!! and if anyone else wants to play ... make sure and share it with us! hey, thanks . . .
figured this card was appropiate. wanted to say "thanks" for all the nice comments on my last layout i shared. i really do appreciate them! 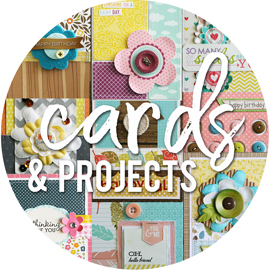 from the scraps out of my last layout ... and a few more embellishments ... i have 6 cards going. 2 of them in this style ... and 4 of a different style. i'm always amazed at how much you can get out of a few sheets of paper. i'm not big on storing little scraps of pattern paper. if it's a large chunk, or a really good paper ... sure, i save it. but random scraps from random manufacturers ... i don't like to store them. so i try and use what i can ... and then i toss the rest. shocker, right? lol! so much stuff going on right now ... crazy busy! but it's all good stuff ... so i don't mind! hoping to get some more cards finished this weekend. and i also have a challenge layout coming up with someone just for fun ... and we should have it ready to share on monday. i'm not usually one to say this outloud (in my mind, yes ... outloud, no) ... but just how gorgeous is this? i was actually shocked at how good this layout turned out. i just love it. and it all just kind of fell together ... there was no plan with this when i started ... the right pieces just seemed to appear before me. from the polka-dot paper that i picked up the other day at a new lss ... because i didn't want to walk out without buying something. the orange cardstock ... which was in a pile from a recent goodie box. more cork ... because it was sitting on the desk. the clear buttons ... that i HAD to have and yet have NEVER used. the chipboard buttons ... which seemed to match perfectly. the metal rims ... which i love to use over and over. and the title ... which i wasn't really looking for ... and yet i found it and it seemed perfect. so this is the layout that i started using the star-diecut paper. the scraps that came from this went into the card i posted yesterday ... with some scraps from another layout that is still needing to be finished. 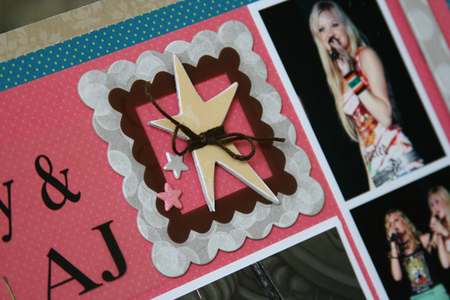 i wanted to use the star die-cut paper as part of a challenge that nichol did on the ki memories blog last week. 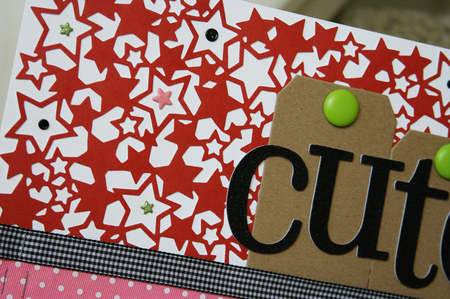 i had the red star paper ... and i'm loving the red/pink/green color combo lately. with touches of black and white to really make the colors "pop"! 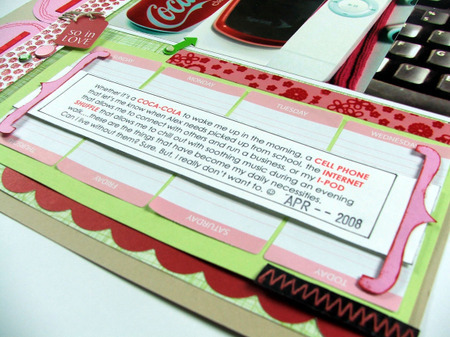 the decorative scalloped notecard is from the april KOTM. 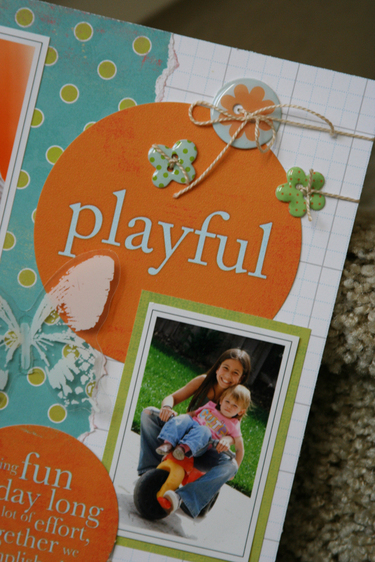 the ribbons, shimmer chipboard letters, mini button brads, and shimmer star brads are all from making memories. and the jumbo brads are heidi swapp. i just love this die-cut paper ... but i won't even tell you how long it took me to get up the nerve to cut it. lol! huge decision ... and you just can't rush cutting paper like that. back to work i suppose. my girls are back in school this week ... after a month off. so we're adjusting to getting back on schedule. and i'm adjusting to spending my days with little ones that just don't give me much conversation ... nothing i understand at least. lol! haley is learning to talk ... saying so many new words every day. she doesn't always want to say "laura" ... so i'm trying to get her to call me "dude". nikolas is so close to learning how to walk. he's 10 months. he cruises around this place like no one's business ... flying from furniture to furniture without even a second thought. he lets go of things ... and has that look on his face like he really does believe that he can make it to where he wants to go. so cute! and today he managed to somehow take his pants off twice ... pretty good i thought since they have a good elastic waist. lol! ariana is ariana ... full of funny stories and tons of questions. and with that ... the babies are both awake! back later! a preview of layouts to come . . .
so i'm going to do this a little backwards. 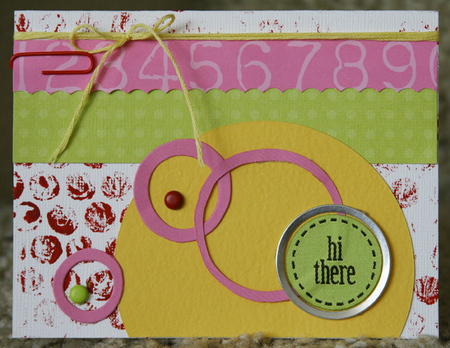 after i complete a layout ... i love to make up a quick card or two using the scraps i have leftover. i figure it's all out and coordinated ... so why not use bit and pieces to make something else while it's all out. this is actually the scraps from 2 layouts that i'm finishing up. so you'll be seeing some of this same stuff on the next few layouts i share. lol! i still have to finish up my journaling ... so i'll probably share tomorrow. this card was made using a decorative scalloped envelope and journaling card from the april KOTM ... which i'm so glad i got because it has some super fun stuff in it! the journaling card is just that ... a one-sided card. so i just added a piece of cardstock to the back to cover up my brads and staples ... and i figured i can write on that. the die-cut star paper is ki memories. and i cannot tell you how sad i was to use that little piece of pink polka-dot ribbon ... it was the last little bit i had left and i must get more of it! lol! ribbon, shimmer star brads, and rubon are making memories. although after seeing this picture ... i think i'll switch out one or two green brads for the pink ones. not sure why i didn't think of that before. lol!and the cork is karen foster ... ever since using it last week on that school layout i can't stop using it. there is more of it to come this week ... trust me! 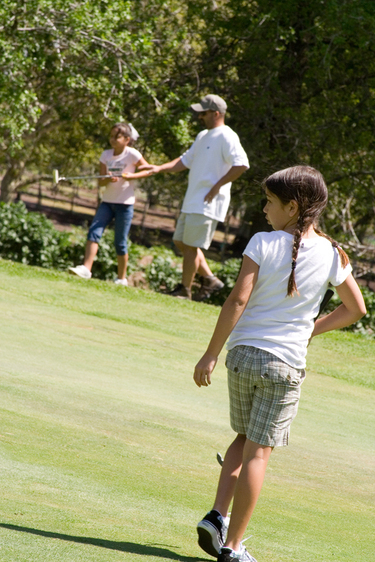 our golfing adventure . 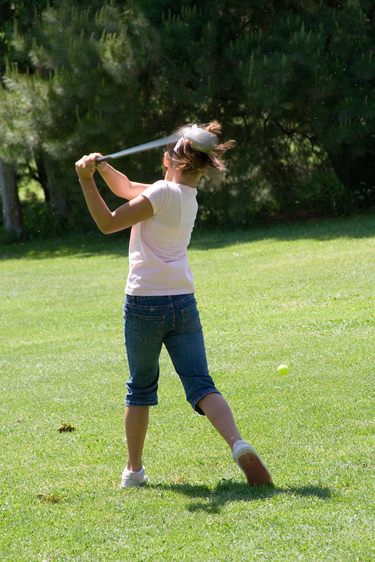 . .
so one of the things we decided to do on my day off last week was to go golfing. 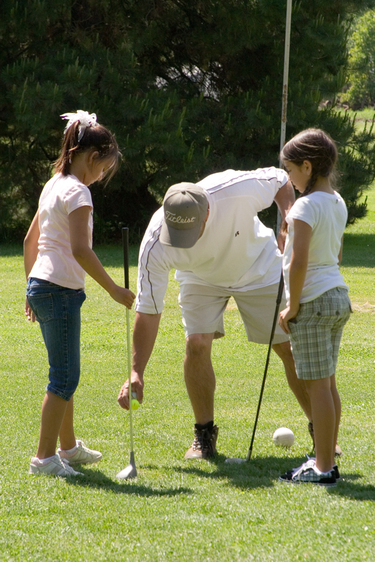 not miniature golfing ... but real golfing. my dad actually gave me the idea ... i just wasn't coming up with anything that the girls were interested in. 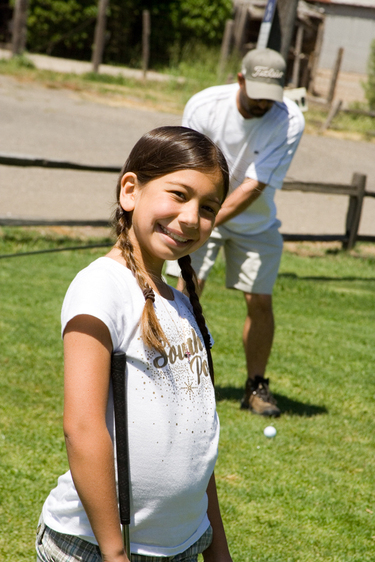 he told me about this 9-hole golf course that wasn't too far from here ... and it was supposed to be fairly easy and family friendly. joe is a big golfer ... so i figured he'd be all for it. 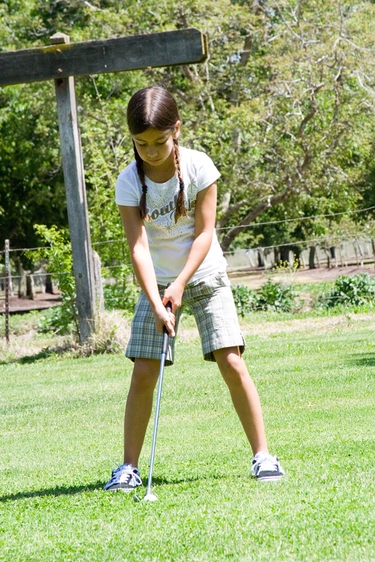 and my brother and sister-in-law had gotten the girls some real golf clubs for christmas a few years ago ... and they've never really used them. 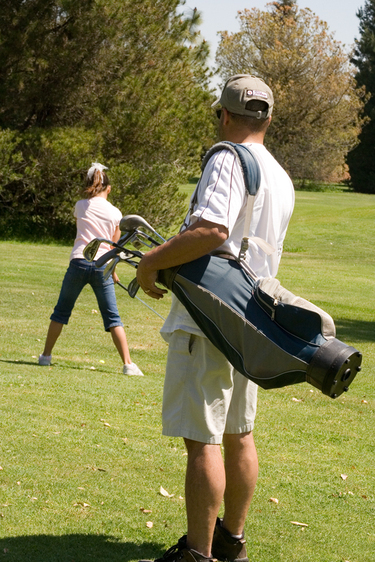 and just a disclaimer for joe ... that bag he is carrying is the girls golf clubs. lol! he just tossed a few of his clubs in there ... he didn't want to be lugging his bag around too. just don't want you thinking he has some teeny, tiny bag. lol! the girls did really good. they got really frustrated in the beginning ... definatley harder than miniature golfing. lol! joe kept saying "you think it's so easy to hit that little ball that isn't even moving"! here's probably way too many pictures from the day. believe me, i narrowed it down ... they just all seem to go nicely together! click on any to see them bigger ... and excuse the harsh, overhead sun (it was right at noon). and this next one? yeah, the hole was across this water area. not sure what you call it ... a stream? anyways, it seemed so far away. we figured we'd let the girls each have one try at it ... with an old ball. and i was very surprised that both of them made it across. in fact, on sarah's swing seen in this next picture ... she actually landed her ball all the way past the hole and in those trees in the back. lol! for the record ... i hit one hole. we didn't pay for me to golf ... just joe and the girls. so i didn't want to get in trouble. lol! but i snuck in one hole ... and i was NOT good at it. and there was one photo of me doing it ... but apparently my family still does not understand the importance of "filling the frame" and using the zoom that was on my lens. lol! so needless to say ... no photo of me participating. but i was there ... photographer and caddy! just a quick layout that i did the other day. i had this photo of alyssa and haley from a few weeks ago and thought it was so cute. this is some really old product. the dot pattern paper, the transparency butterfly, and the chipboard circle die-cuts (title and quote) are all from my mind's eye. i'm not even sure how i came across them ... but they were all together, so i just used them. 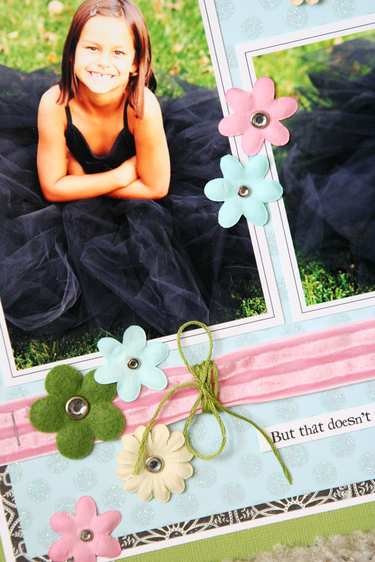 the chipboard buttons are making memories ... love those things! and i adhered the butterfly with a glue line right down the middle part ... and then bent the wings out a little to add some fun dimension. i know it'll flatten out once i stick it in the album ... but for now, it looks cute! 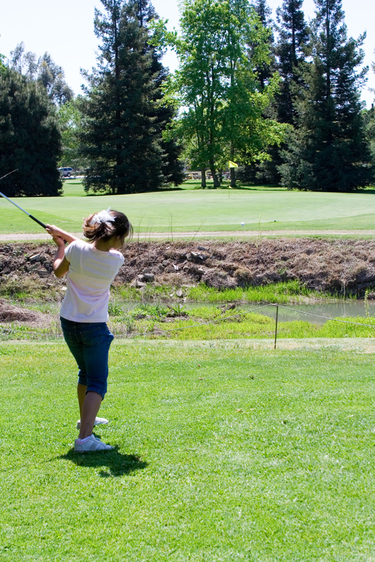 trying to sort through photos today from our golfing adventure ... hope to share some of those tomorrow! have a great weekend! white ink and chipboard challenge . 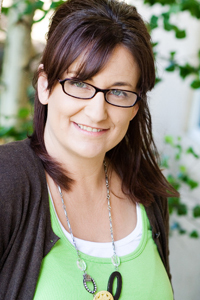 . .
the incredibly talented nichol posted a challenge on her blog last week. the challenge was to use white ink and raw chipboard on a layout. i'm still learning about stamping ... so i didn't get too crazy. this is actually the first time i've ever used white ink. i have wanted to scrap these photos since we went to the aly and aj concert ... a year and a half ago. i was so excited that i got such great photos ... i have tons of them that were so good. and i just love their music ... listen to it all the time. in fact, when the girls were in disneyland ... that's just about all i listened too that week. their first cd is my favorite ... but the second one has some great songs too. and i actually sketched this design out ... i very rarely sketch any ideas. but i didn't start this until last night ... being as i'm so last minute and all. so we were driving to our golfing adventure yesterday since i had the day off (more on that later) ... and i'm sitting in the car sketching my idea. then after golfing, we went to grab a late lunch ... and one of my favorite aly & aj songs came on in the restaurant. and of course, i start singing and talking about aly & aj ... and then pull my sketch out of my purse to talk about the layout i'm going to make that night. yes, the girls said i was dorky and embarrasing! lol! go figure! so, back to the challenge. lol! like i said ... i'm still trying to learn this whole stamping thing. but nichol has me seriously wanting to learn more! 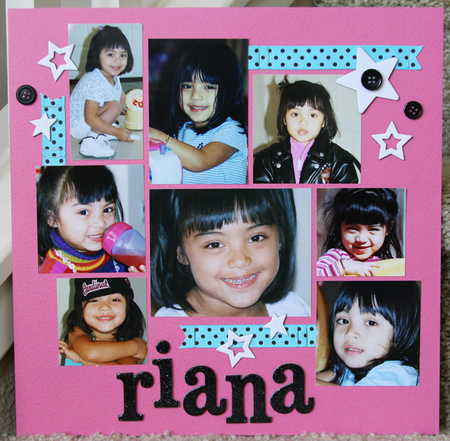 for this layout, i took the raw chipboard frame and stamped it with the white ink using a polka-dot foam stamp. simple enough, right? 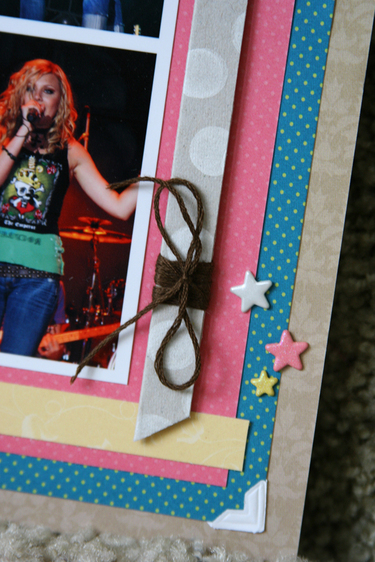 i also cut a strip of chipboad to use down the side of the layout ... and did the same stamping on that. 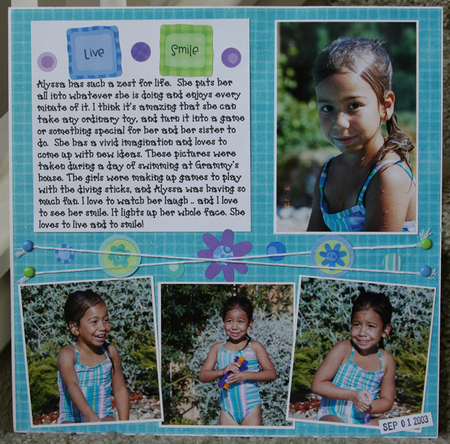 pattern papers, shimmer brads, chipboard frame, clear frame, and staples are all making memories. chipboard star is scenic route. polka-dot foam stamp is heidi swapp. white ink is tsukineko brilliance ink (which i know nothing about ink, it's just the one i picked up). sarah's new room . 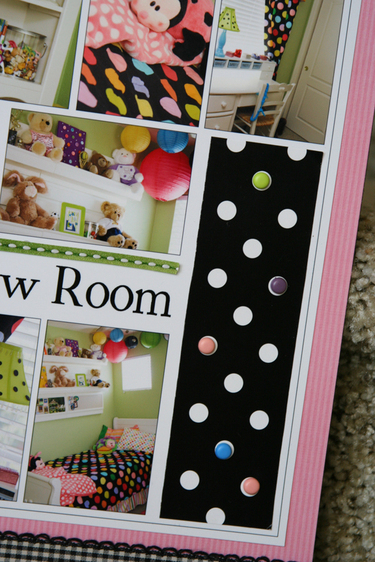 . .
ok, so she got her new room almost a year ago (her 8th birthday present) ... but i am just now creating a layout about it. lol! i love the way this layout turned out ... so colorful even with the black. and that's just how her bedroom is. i love how colors just seem to "pop" when paired with black ... and that's one reason i fell in love with her comforter set and curtains. and i love polka-dots of any kind. i had taken these photos on her birthday ... right after re-doing her room. i posted about it all HERE. i just pulled up some photos ... and created this collage in photoshop. when i do these, it does require some math ... and i think i had the middle part figured out wrong ... because i thought the pics would go all the way across. lol! but i just worked with it ... and then added some decorative tape to it after i printed it. and the title? why do i never think to add text to my photos/collages before i print them out? lol! it made it super easy ... and i used my favorite-font-of-all-time too. i had it placed a little too far down ... so i simply added a thin ribbon above it. embrace your mistakes my friends ... embrace them! i used ki memories pattern paper. heidi swapp decorative tape (the black polka dot). and making memories brads and ribbons. super easy and quick. need to do more collages like this when i have a bunch of photos! a school layout . . .
ready for another one? i printed out these photos from the girls first day of school last july. well, the first day of school was last july ... i printed these photos this week. lol! i had an idea for this when i started ... and i'm really surprised at how quickly it all came together. i found this old cork paper by karen foster in my stash ... it's real cork with a sticker backing. i just tore a piece off of one side ... and used the large piece on the layout. also used some older KI memories pattern paper and some of the newer lace paper. i added brads and eyelets on the lace paper ... it's been ages since i've used eyelets. other goodies are heidi swapp large ghost star (which i painted blue), hero arts stitched circle stamp, and other making memories embellishments. then i was trying to pick out my title letters. i wanted to use these chipboard letters from making memories ... but the only "s" i had was orange. so i found a plain, raw "s" and figured i'd paint it pink. only the pink didn't quite match the other pink on the "o". so i thought i'd stamp something on the "s" thinking that might help ... even took out some white stamp ink that i've never tried. but that wasn't quite right either. long story short ... i wish the "s" matched the "o" better. lol! i know, i worry too much sometimes! and speaking of making memories ... go browse their new website. i noticed tonight that it's got a new look ... and all sorts of info and pics of all their newest products. and i wasn't going to make a big deal about this ... but i have to share because i'm so over-the-moon excited. now when you visit the MM blog ... you can find me by looking under the "designers blogs" on the sidebar! i'm sure you all know that i'm a huge fan of the company ... have been for years and years. and i'm also sure you know that i've been very fortunate to have done some fun things for them this past year or so ... because i love sharing. what you may not know ... is that all this time i've never been sure how "official" i was. i know, i'm such a dork sometimes. lol! but i can now say that i AM official ... i am part of the team! i am totally honored and appreciative for the opportunity ... and look forward to being part of this amazing team! so thank you MM!!! my little ballerina . . .
ok, so she's not a ballerina ... and has never ever taken a single dance class. but when i made this tutu about a year and a half ago ... she was all over it! i've always loved these pictures of her ... so i finally decided to scrap them. 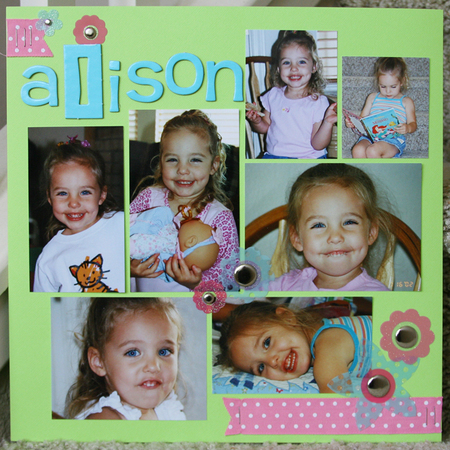 i used all making memories products on this layout. some paper from the garden party collection ... and some from the 5th avenue collection. garden party ribbon. and lots of fun flowers ... paper and felt with rhinestone brads in the middles. the sticker is a really old one ... but i came across it and decided it worked for me. edited to add: since a few of you have asked ... the font is called "prissy frat boy" and you can download it for free HERE (just scroll down a bit). i use this font about 90% of the time ... i think it's just "my font" now. lol! sarah saw this today sitting on the counter. and she told me "you're right ... i've never, ever dreamed of being a ballerina"! at least i can say for sure that what i journaled is accurate! lol! so relieved . . .
i cannot tell you how relieved i was today ... when i actually scrapped! i got so caught up in organizing and photo editing and a bunch of other stuff. that for the past month i havn't scrapped hardly at all. i've done some layouts for assignments. and those 4 super simple ones last week. but that was it. i've sat down intending to scrap ... i've dug through photos to scrap ... i had calls listed that i wanted to make some layouts for. but nothing was coming to me. seriously, nothing. as in nada, zilch. it was actually getting kind of scary ... it was as if i forgot how to scrap. i did nothing for the entire past week. and i had plenty of time while the girls were away last week ... but i would just sit there and twiddle my thumbs. but last night, i finally picked out a few photos that i thought might fit with a few magazine calls ... calls that end tomorrow, mind you. no pressure ... i do my best work at the last minute to be honest. so i made photo collages all nice and pretty ... and printed out a few sheets of photos to scrap. that was last night. and today, i scrapped 4 entire layouts. which is quite good i think ... considering i had 4 kids here today. lol! gotta love naptime ... 2 naptimes since nikolas is still little! and i'm really happy with the layouts. will share when i take some pics of them. and for any of you that might have been jealous of our gorgeous weather here this past weekend? yes, sunday was i think 95 degrees ... we had shorts and flip-flops (capri's for me), swimming, air conditioning running, and windows open all night long. wonderful, right? well, today was a different story. it dropped down to 70 degrees ... but with winds of at least 30 miles per hour all day long. it sounded so crazy out there. and then sarah had a softball game tonight ... at big leaque dreams. i cannot begin to even tell you how cold and windy it was. as in "hold on tight so you don't blow away" type windy. she plays there again on wednesday night ... so i hope it's not so bad then. an older layout . . .
i seem to have nothing creative to share lately ... at least when it comes to layouts. 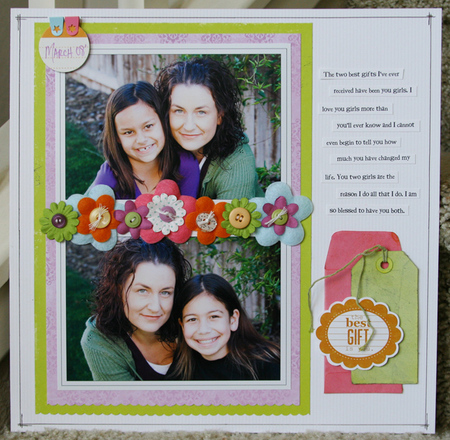 so i thought i'd share an older layout i had in the october 2007 issue of scrapbooks etc. i don't think i ever shared it here ... so here you go. this was my first ever assignment. it was for the "make it yours" column ... where you have a layout that you use for inspiration. the final layout did have chunkier title letters ... they wanted them to mimic the original layout's title letters a little better, so i had to change them. you can actually see the original layout and mine HERE ... and see what they wrote about it. and i'm pretty sure that this is one of my heaviest layouts ever. lol! all that chipboard, buttons, and brads really added up! other than that? the girls are home ... so glad to have them back. they had a blast ... will have to post some of their pictures and stories later. 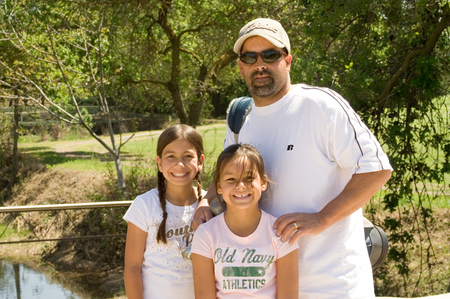 i totally owe alyssa's dad for taking them ... he is such a good dad, to both of them. always includes sarah in everything and i appreciate that more than he knows. and within minutes of them getting home ... the house is once again a total mess with their stuff scattered about. today they couldn't wait to do two things ... see amanda (their "sister", as they love to call her) and go swimming at grammy and papa's house. we made it a package deal ... and had amanda come over and go swimming with them. which worked out ... because it was 90 degrees today! and not a breeze in sight ... i actually had to turn on the air conditioning once the house got to 80 degrees inside. if you catch it too late ... there's just no way to cool it down. joe is on vacation for the next week ... and it's the girls last week before going back to school. i am not on vacation though. lol! actually, i did take thursday and friday off ... so we'll plan something for then. that's it for now ... hope you're having a great weekend! absolutely nothing . . .
"nothing, nothing ... absolutely nothing" ... i do belive that's a backyardigans song. kind of sad ... but it's been in my head all day long. which is weird ... because the tv has been OFF all week long (except when joe's around). but it pretty much sums up what i've accomplished this week. whenever the girls aren't here ... i like to really take advantage of the alone time and get a lot done. and usually i do. but not this time. i had big plans for myself ... all the things i wanted to work on and get started. i did do a few things. i got a few layouts done for an assignment ... and they turned out really good. but i can't share. and i did do those 4 layouts the other night ... but those are more plain, get-em-done type layouts. love them for "why" i did them ... but not quite the pretty ones that i like to show off. i am totally caught up on my photo editing. since i shoot in RAW ... i literally have to finish the processing on every single photo before it can be shared or printed. and i did them all ... every single one. i cleaned out some magazines ... sifted through and pulled out the ideas and layouts that i want to hang onto. then i tossed them in my "idea drawer" ... and realized how much i had in there. so i cleaned that out today ... purged the torn out pages that weren't inspiring me anymore. nice to clean out that huge stack. but other than that ... nothing. i think i've actually worked harder this week because the girls aren't here. i'm realizing just how much they help out around here. in a way, it's the noise i miss the most ... crazy, right? but when they're here ... they entertain the daycare kids. not that i just hand the kids off ... or make them take care of them. but just having them here ... it gives the kids someone else to interact with. gives me little, tiny breaks here and there ... when i'm cleaning, picking up, or washing bottles. but this week ... i have been the one and only source of entertainment for these kids. they look to me for everything. so not only am i taking care of their needs, feeding them, wiping their tushes and cleaning their noses ... but i'm also in charge of keeping them busy and having fun. i know, it's my job ... but i usually have a little help. lol! and that means that since i've worked harder ... i'm more drained at night and all the energy has been sucked out of me by the kids. so i do nothing at night. i'm actually not trying to gripe about anything. because we all know that i shouldn't be allowed to say anything "not-so-good" about my job ... or to have any "off" days. lol! (by the way ... that was said in total sarcasm ... those of you that know a little backstory here will get it. lol!). just telling about my week. i've had a few days this week that i had to get up earlier than usual ... i'm not a morning person. and today, my regular daycare kids (on my regular thursday schedule) left super early in the day ... but i had "new kid" come last minute. so what could have actually been an unplanned day off (which never happens) ... and i was stuck here with all day with a drop-in kid. nothing against him at all ... he's a good kid. just threw me off all day. i am so overdue for a vacation day ... i think the last one i took was back in november ... or was in august? speaking of daycare stuff ... and being able to say a few things about the job without upsetting anyone or having anyone taking it too personal. i found this blog a while back ... have no idea how i even came across it. but i thought it was hilarious to read ... it's not all mary poppins. such funny stories about her daycare kids ... i can totally relate and makes me realize all the stuff here is normal. and to quote her. 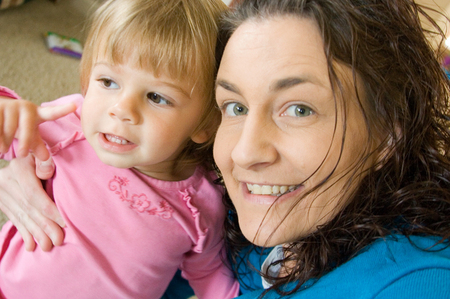 "a childcare provider is expected to be a superhuman mix of the madonna and mary poppins, ever patient, loving, kind, always delighting in the sweetness of her charges. i don’t do such a bad job, all in all, and it’s far more likely the parents than the children who strain my sanity most days. but i’m here to tell you: it’s not ALL mary poppins". love that. i'm not saying i have issues with the parents ... don't get me wrong. i don't. i just didn't want to edit her quote. lol! i'm just saying that i love her outlook. the way she sees the day-to-day job in a funny, sarcastic way. we're dealing with little itty-bitties ... we take our humor where we can find it. lol! i have only left the house for 2 things this week. one of which was soccer signups last night. just a random thought. why is it that whenever i have to sit and fill out a form on the spot (meaning you don't get the form until you get there along with a zillion other people) ... i suddenly can't remember my kids middle names, their birthdays, or their mom's work number??? 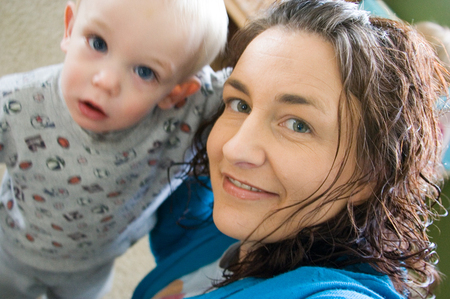 and yes, i'm the mom ... and i work at home ... so you'd think that would be easy. it's like it's too much pressure to answer everything there ... and my mind goes blank. but i did it ... and $160 later ... the girls are signed up for their 6th year of soccer. the other place i have gone this week is starbucks. one thing that helps keep me sane ... makes my day just a little brighter. sad, but oh so true. and today the dude working the drive-thru said ... "would you like an extra shot of expresso added to your drink ... for just 55 cents it will make your day THAT much more amazing". and you know what ... i almost did it ... he was that convincing. and my day was certainly NOT amazing ... so the idea that for 55 cents it could GET amazing was tempting. lol! but i was already feeling jittery from not yet having caffiene ... and it was already after lunch. so i passed. i know, i know ... this is truely important stuff i'm blogging about tonight! this is what my week has become. i'm so sorry. lol! the girls get back tomorrow from disneyland. maybe having them back will help my creative juices start flowing once again. let's hope so!!! my fastest layouts . . .
first, i'll show you these four layouts ... and then i'll tell you why i did them last night. and i appologize for the so-so pictures of the layouts ... i was trying to rush so that i could get this posted while the babies are sleeping! so last week as i was organizing some of my albums ... i came across an 8x10 creative memories album. apparently it was for daycare pictures. this was before i started actually making layouts with the daycare pictures ... i think i started doing those after my first year. so i guess my idea was to make an album where each kid had their own section with their pics. only think is ... all i had in there were 3-4 pictures on each page. no names, no journaling, no pattern paper, no nothing ... just pics on white pages. and of course a ton of them were cut into circles and ovals ... remember, this was from almost 6 years ago. so i decided to tear out all the photos. tore them right off the pages ... and tossed all the pages away. i didn't want to just get rid of the photos ... because these held memories for me and my girls from the kids that were here years ago. but i didn't want to just file them away. and i didn't want to spend a whole bunch of time on layouts ... since honestly, these kids aren't here anymore. we still see them, still talk to them, still keep in touch ... but they're not here all the time. so i literally just grabbed one sheet of cardstock and started arranging the photos on there ... working from the middle out. i was able to salvage some of the circles and ovals ... i just had to trim them pretty tiny to get the straight edges. lol! and then i just dug out some chipboard letters for their names ... and added a little bit of embellishments. these were actually hard for me at one point ... the fact that i didn't have any pattern paper on there was really throwing me off. but i like that they're simple ... and that they hold a good assortment of pictures from the time they were here. and i love that i got all 4 of them done in under 2 hours. 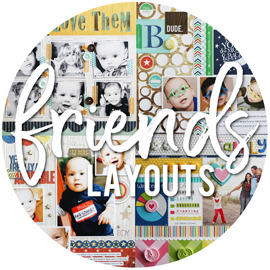 and loved that i eliminated an entire album that really had no meaning ... and now can just file these layouts away right in each kiddo's section of our "friends" albums. 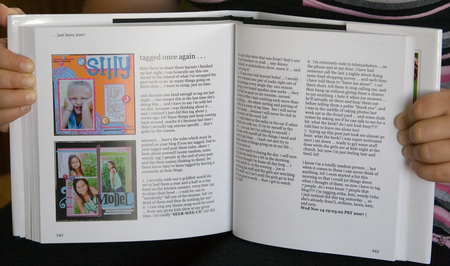 and remember, these pages won't be side by side in an album ... they'll be in different sections. so just another reminder that when you find a good page design ... use it for several layouts at the same time! it saves you creative energy when the design or sketch is already there ... and you just have to switch up the colors or embellishments a little. and no one will notice when these pages are spread out in the albums in different spots. take the shortcuts when you can! the "book" has arrived . . .
the "book" that i won't even begin to tell you how many hours i put into ... mainly because i think i've already bored you with the details enough as it is. lol! the UPS dude pulled up this afternoon and dropped this off to me ... have i told before how much i love the UPS dude?!?! 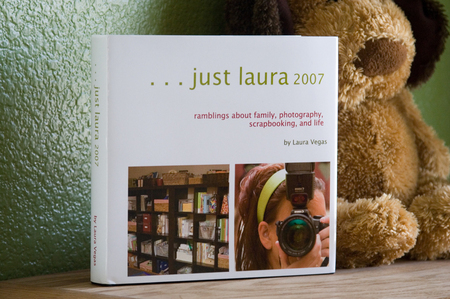 it's the cutest little book ... 7x7 in size. i was a little worried that it would be too small ... or to hard to read. but it's perfect. and it worked out really well with the photos that uploaded from my blog. 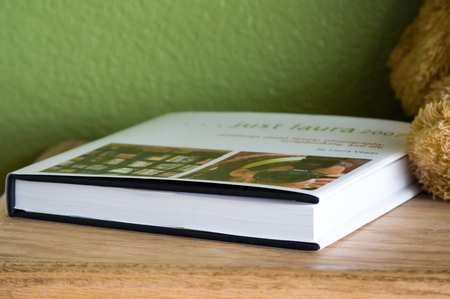 since all my blog photos are resized ... a larger book would have required me to replace all the photos with the full-sized versions. any idea how long that would take?!?! lol! and i think i mentioned that there was a reason i wasn't going to add the white borders to my blog photos anymore, right? it's because when they get pulled up into the blog book ... you don't have as many options on cropping them into the page designs. a lot of these pages had a spot for a square photo ... but because i had the borders ... there was no way to really fill up that square without a border showing on one of the sides. so this way, if i leave off the borders ... i can crop into my photos more in the book and fill up the spaces. here's a few pages just to give you an idea of what i have. for example, on that second page here with the 4 pics ... those 4 pics could have filled up the entire page with 4 square photos. and the first page ... those would have been larger squares too. there were a lot of posts that i would have loved to add more photos too. posts where i've linked you over to other sites to see something i've done ... or linked to a photo album with additional photos. but most of them, i didn't do. this was one that i did add more pics too ... mainly because i had an extra page there where i didn't want to start the next post. if i had more time ... i would have done all the ones that needed to be done. although now with my faster computer ... i could have, but oh well. lol! so there you have it. "the book". lol! and thanks to amanda for being my "book holder" for the pics. i already have my 2005 book all uploaded and ready to order. but i'm already half way through my 2006 book too ... so i'm going to wait and order them at the same time. then, since we're all bored to death here without alyssa and sarah to entertain us ... we did some quick "laura and me" photos just for fun. i will say right up front ... i'm not having one of my better days. my hair is a mess ... i'm scheduled for a haircut on friday. i only did half my makeup today. i only had about 5 hours sleep last night ... was up super late finishing up some assignments. i was also too lazy to go get my external flash ... and my camera settings were way off. but i didn't have time to mess with it ... because of these 3 kiddos that apparently require a ton of attention. an almost 10 month old, a 16 month old, and a 17 month old ... super crazy! luckily, they're all good kids and get along pretty well. and they're all on the same nap schedules which is super nice ... then again, that means they're all awake at the same time too. lol! and me and amanda ... who has been deemed my "helper" this week with the girls away. 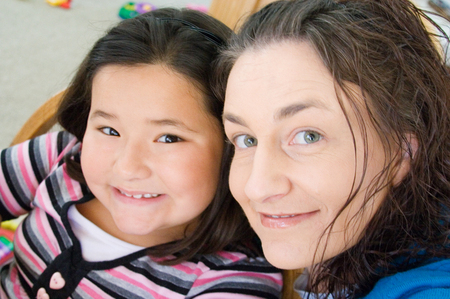 she has been great at helping with the kids and talking to them and picking up after them. just as long as she doesn't have to pick anyone up. lol! i don't know why ... but she does not like to hold them. funny, since that's all alyssa and sarah do ... hold the babies. at the same time ... amanda is bored out of her mind. i've taken down tons of the girls "good toys" to play with ... and she's watched a few of the new shows that i've recorded for the girls that she usually misses. but from me and amanda both ... "girls, come back soon because we both really miss you!!!". need inspiration . 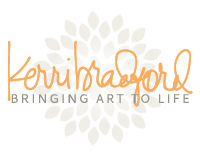 . .
are you looking for ways to get inspired to create? if so, check out the MM BLOG today for a few ideas ... one of which was mine. i wrote that a few weeks ago ... but i have to say it's so true. i definately took my own tip the last week or two ... and it's really gotten me inspired to get back to scrapping! love christy and wendy's tips too! i started working on my 2006 blog book today ... and thought it was kind of funny when i got to my posts from april. that would be april 2006 ... 2 years ago. first ... THIS POST ... about the girls going to disneyland with alyssa's dad. guess where the girls are headed tomorrow morning??? disneyland with alyssa's dad! lol! and just like 2 years ago ... i'm worried about sarah and hopeing she'll do ok and not miss us too much. also, just like that post ... i have big intentions of getting lots done while they're gone. unlike that post ... i did not take any vacation days and am working all week. second ... 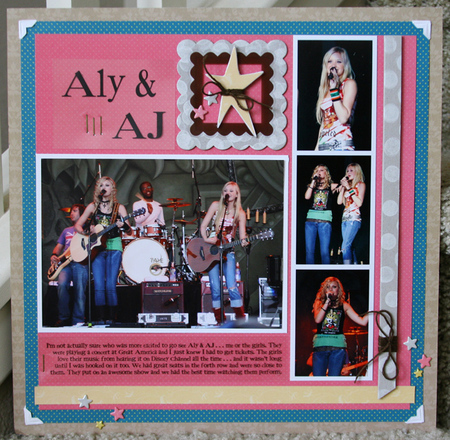 THIS POST ... scroll down the part about rocking out to my ali & aj cd. guess what i happened to be rocking out to on my ipod tonight??? aly & aj! and yes, i most certainly copied over their cd to my ipod ... along with both high school musical soundtracks! lol! third ... THIS POST ... about all the stuff i got done last time they went to disneyland. that was an impressive post, right? i can only pray and cross my fingers and toes that i will be able to make a post like that at the end of this week. lol! i have big plans ... a lot i want to get done ... a lot of older stuff i want to work on. we'll see how that goes though! and lastly ... THIS POST ... about organizing all my albums. yeah, apparently i spend a ton of time on this just 2 years ago. and once again, i have spend a ton of time these past few weeks on the same thing ... probably re-organizing all the same layouts i did 2 years ago. lol! but as of last night ... all my family albums are totally done and looking good on the shelves with pretty little tags hanging on the spines. feels so good! i could probably go through tons of my posts and find things that are so similar to what we're doing now. but just those few from april of 2006 caught my eye ... fun to look back to what you were doing the same time in a previous year. the wonder of technology . . .
first up ... my laptop. last sunday night i ordered myself some new memory ... and it was here by wednesday. alyssa's dad installed it for me this afternoon. i won't even humor you with how little memory my laptop had up until today ... it was tiny. i am now sporting 2 gigabytes of memory ... and am amazed at how quickly everything is moving. there's 2 ways of looking at this. number one ... i'm super excited that everything is so fast and running at top speed. but then again there is number two ... kind of mad that i have spent all this time putting up with something that was sooooo slow. lol! too bad i didn't know better ... and didn't realize sooner that the memory could be my problem. things were slow ... but i just thought it was normal. and the fact that all this only cost me $42.00 total ... even more amazing! guess what has come out of this super fast computer just tonight? in only 2 hours time ... i have my entire 2005 blog book ready to go. granted, i only had 7 months worth of blogging since that was my first year. but it only took me about 2 hours to upload the entries, go through them and edit the page designs, arrange the photos, and get everything alligned on the pages. all i have left is the cover ... and only because i'll have to dig out some photos for it off my external harddrive. 94 pages total ... ready to go. i'm sorry ... how long did the other book take me?!?! lol! i can't wait to pull up 2006 and knock that one out too ... will be nice to have all 3 books done and complete. then there is this little piece of heaven! i've always thought that it wasn't something i needed. and now that i have it ... i'm not sure how i lived without it! to be able to listen to whatever i want ... in whatever order i want? and not to have to get up and switch cd's in the cd player ... or spend my time trying to figure out why the music is only coming out of one speaker ... or why it doesn't want to play that day? amazing! i've got a ton of my cd's all loaded up ... but i still have a bunch to go through. i think right now i have about 300 songs on there ... not even a dent. although it appears that it has been stuck on brooke white's songs ... the 3 that i downloaded off itunes last week. "love it a battlefield", "let it be", and "every breath you take" ... love her versions of them. love her voice ... and love when it's her and the piano. makes me want to get back in there and see if i can still play the piano ... i like to think all my years of playing would come rushing back to me. lol! so yeah, the 3 songs have just kept playing and playing. i'm funny that way ... i can listen to the same songs over and over and over. and guess what ... sarah's the same way. she'll listen to a song about 30 times in a row ... drives alyssa crazy! what do you know, i do scrap . . .
i bet after all this time, you thought i gave up scrapping. lol! i can't remember the last layout i shared. partly because i havn't done anything in almost 3 weeks. this is actually a layout i did 3 weeks ago ... just added the journaling last night. all those buttons and flowers are from the making memories new buttons & blossoms boxes ... they are so cute with the felt flowers and paper flowers. and some older MM products ... the tags and the papers and clips. that's all i have right now. still organizing albums ... i have a few more coming today in the mail and then my family ones will be all set. finishing up an assignment today. finished a huge photo order last night. other than that ... just busy with work, family, and apparently more kids than i know what to do with (somehow i think that's related to family and work. lol!). will be back to share more of what we've been up too later! you have to go get these actions . 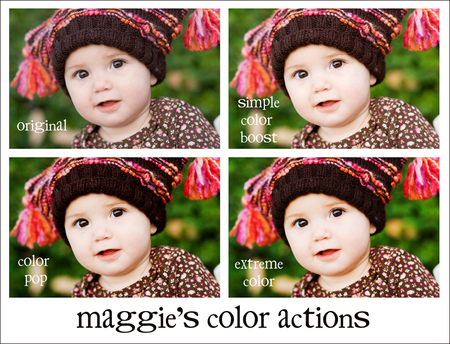 . .
one of my favorite photographer and scrapbooker friends, maggie holmes, has just announced that she is selling her photography actions. yay!!! you can check out the details on HER BLOG. so excited for her! i have always admired maggie's phography skills ... i just love the look and style of her photos. i think i have tried to gear my editing to look somewhat like hers ... i love the way her colors just POP! and now she's offering actions that can help achieve her look ... with the simple press of the "play" button. she asked a few people to try them out for her and give our feedback ... and i was completely honored to be one of those that she asked. here's a quick sample of a couple of the photos i played with. click on them to see a larger version. i love the color action set ... such rich colors. there is also a lighten action included ... for those that need a little exposure help. and the vintage action set is so gorgeous. i have never really tried to get a vintage look on my photos ... so an action is perfect to do it for me! all of her actions are so easy to use ... and run very fast and smooth. i have played with a ton of photos using them ... and have had consistent results with all of them. so go check them out and read more about them on her blog. i know you'll enjoy them! and while i'm enableing you all ... did you remember to go order the LB april KOTM today? 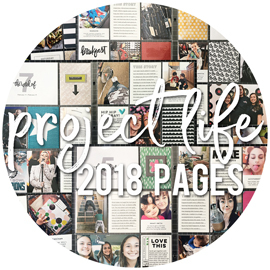 has lots of fun stuff ... and i've loved seeing all the ideas from some of my favorite designers!